THURSDAY, Sept. 27, 2018 (HealthDay News) -- Wearable defibrillators do not lower the chances of dying from sudden cardiac arrest among high-risk patients who've just had a heart attack, a new investigation concludes. Worn externally as a vest, these defibrillators are a noninvasive alternative to surgically implanted defibrillators. Both are designed to deliver a corrective electric shock to the heart if a heartbeat rhythm goes out of whack. While implanted defibrillators are known to save lives in the months and years following a heart attack, "prior clinical trials have found that implantable cardioverter defibrillators did not lead to a survival benefit in the first 40 to 90 days" right after a heart attack, said cardiologist Dr. Gregg Fonarow. So guidelines prohibit implantation during the first 40 days after a heart attack, or during the first 90 days among patients who've had bypass surgery or stent implantation, explained Fonarow. He is director of the Ahmanson-UCLA Cardiomyopathy Center and co-director of the UCLA Preventative Cardiology Program in Los Angeles, and was not involved with the new study. According to Fonarow, despite a lack of solid proof, many cardiologists have operated under the assumption that wearable defibrillators could pick up the lifesaving slack in those early days after a heart attack. Why? On the one hand, cardiac arrest is a big public health concern. Cardiac arrest, which is not the same as a heart attack, is caused when the heart's electrical system malfunctions and the heart stops beating properly. The American Heart Association estimates it affects more than 350,000 non-hospitalized Americans every year. What's more, Fonarow stressed that the risk of cardiac arrest is "relatively high" in the immediate aftermath of a heart attack, particularly among those diagnosed with low "ejection fraction" (EF). In such patients, the heart's left ventricle pumps out a relatively low amount of blood with every heartbeat. 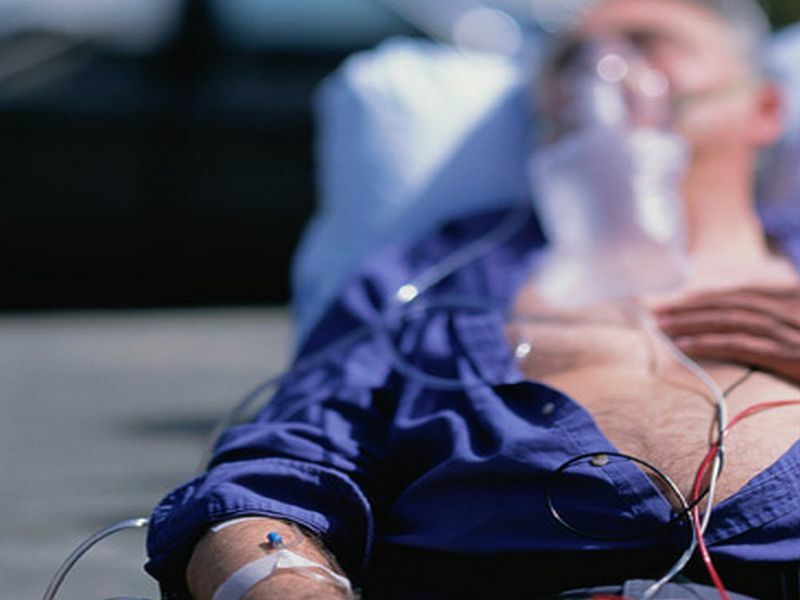 In the new study, all 2,300 patients had an EF of 35 percent or less within a week after being discharged from the hospital following a heart attack. (A normal EF hovers between 50 to 65 percent). About two-thirds of the study patients were trained to use a "LifeVest," a combination harness/vest that is worn underneath clothing. One-third received usual care. On average, the vest group wore the device 14 hours a day for up to three months. However, usage steadily decreased from 18 hours a day on average to 12 hours a day, and by the study's end half the patients had stopped wearing it altogether. Perhaps in part for that reason, the study team ultimately found no evidence that the vest helped to lower sudden cardiac death risk. Fonarow described the study as "well conducted," and suggested that it's a good example of the fact that "many therapeutic strategies that seem plausible don't actually work out the way intended when subjected to a rigorous clinical trial." Dr. Richard Page, who co-authored an editorial accompanying the study, suggested the findings are far from clear-cut. Page noted, for example, that the study team also found that vest wearers saw their overall risk of dying from any cause drop by 35 percent. Exactly why remains unclear. And Page acknowledged that while he "would like to say that the device played a role, we can't, because it's not the endpoint that the study was designed to test." But Page said he would still prescribe the vest "for a patient who I feel is at high risk and is highly motivated to wear the device." "This study was a heroic effort. But there is no question that these kinds of patients are at high risk for sudden cardiac arrest and death," said Page. He is a clinical cardiac electrophysiologist and chair of the department of medicine at the University of Wisconsin's School of Medicine and Public Health. "And during this window of time after a heart attack, they are not eligible for an implantable device," he continued. "But this wearable device -- if you're actually wearing it -- likely offers a very good chance, and almost your only chance, for saving your life if you have a cardiac arrest," Page said. The study was led by Dr. Jeffrey Olgin, who is chief of the division of cardiology at the University of California, San Francisco Center for the Prevention of Sudden Death. Olgin and his colleagues published their findings in the Sept. 27 issue of the New England Journal of Medicine. The research was funded by the U.S. National Institutes of Health and LifeVest manufacturer Zoll Medical Corp.